Hi all! 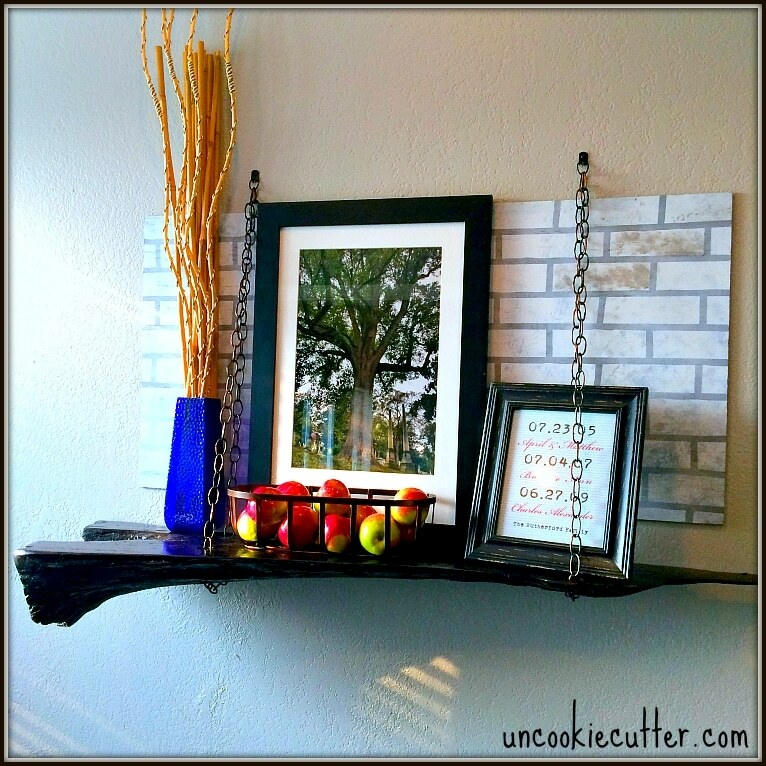 I’m April from Uncookie Cutter and I’m excited to be guest hosting here on Old House to New Home. 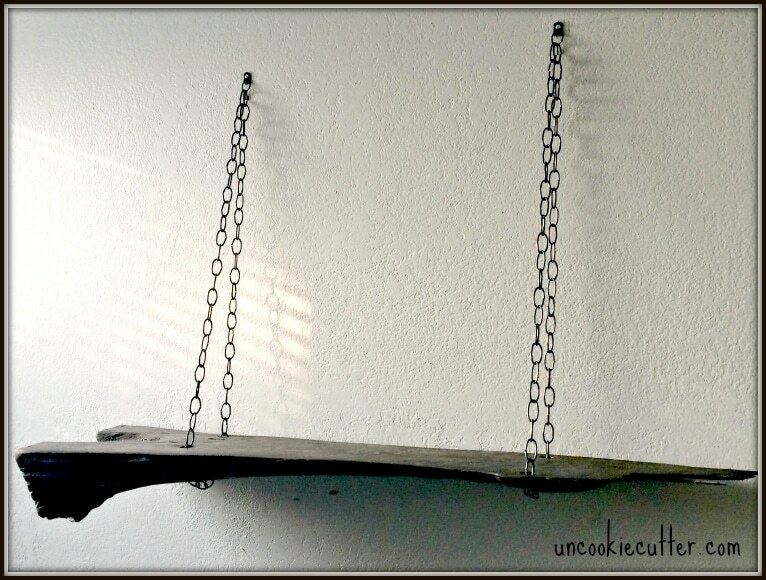 I wanted to share with you all my new hanging shelf that I’m in love with. It was a really quick and easy project that has a huge impact. We moved to Oklahoma in January from Virginia. I wanted a new house in a new neighborhood and what we ended up with was an old fixer upper in a wonderful older neighborhood. So far we are unexpectedly loving every minute of it. One of the great things is I just keep finding cool stuff in the yard to make into furniture, like my tree stump end table. 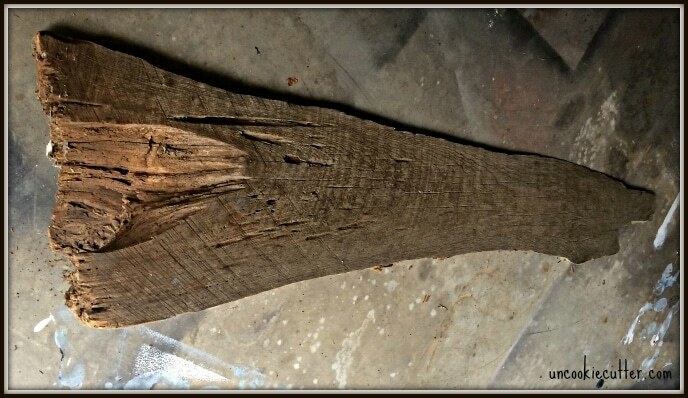 I found this beautiful piece of wood leaning on an old fence post when we first moved in, so grabbed it but had no idea what I was going to do with it. 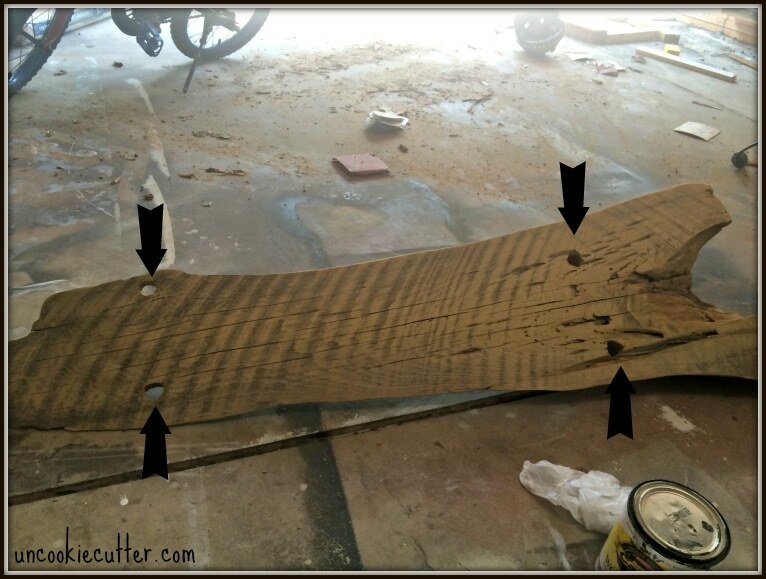 I looked at it for awhile, and recently started working on our dining table. I thought this would be a cool looking sideboard for the table. I originally thought about doing iron pipes for legs, like my friend Emily did HERE. I love her table, but iron pipes are pricey and I’ve used them a bit around this space, so I kept thinking. First, I started sanding, sanding, sanding. That took some time, because it was in kind of rough shape. I used all different kinds of sanders, just going until is was nice and smooth. The sanding will also help get any “friends” out that are living in the wood. I also had the exterminator hit it with his special juice when he was here a while back, just to make sure. Then I drilled four holes into the board. I tried to make them as even and square as I could. I know they don’t LOOK even, but they actually are a rectangle. This will make a difference when we go to hang it. Now it’s time to stain. I really wanted it to stand out against the wall, so I went dark with a couple of coats of Minwax Jacobean. Next I filled the cracks and gaps with epoxy. If used correctly, it does a nice job. You have to work quick, but I really like using it because it makes the board much sturdier and will give you a nice, even surface. Then a little more sanding. Then three coats of Polyurethane and the board was done. 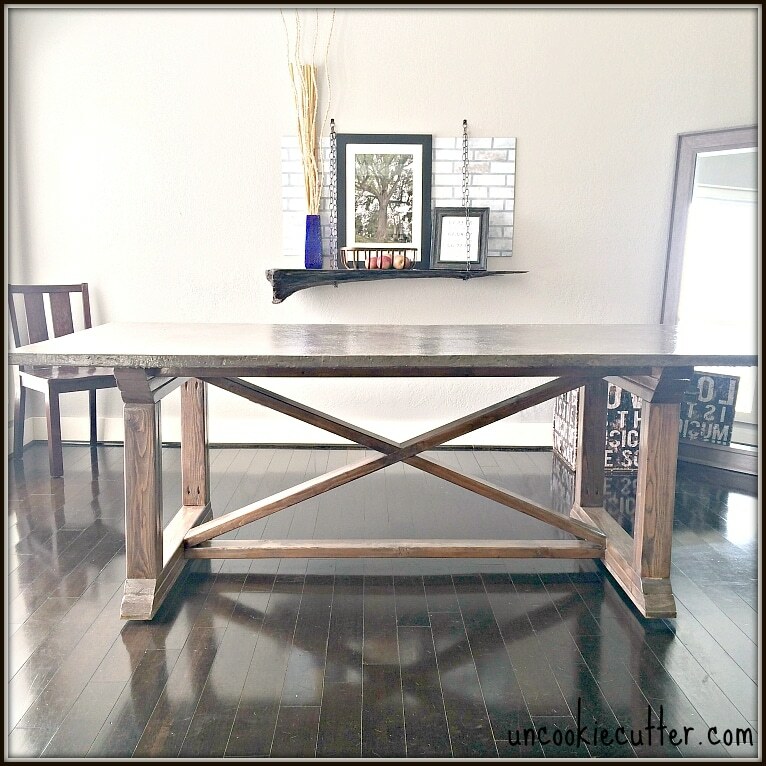 I looked up and a sideboard in a dining room sits 36″ normally. So I marked that spot on the wall. I looped the chain through the holes so it holds it underneath, then I just sorta held the chains until I thought it looked “right”. So a bunch of measuring and math, I found the middle of the wall and the exact places for my two wall hangers. 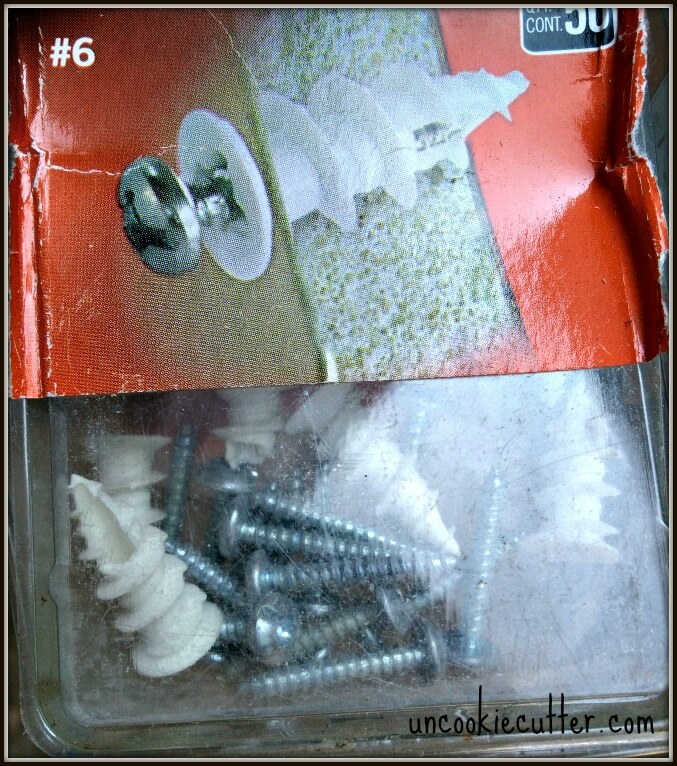 Here’s a little hint on drywall anchors. 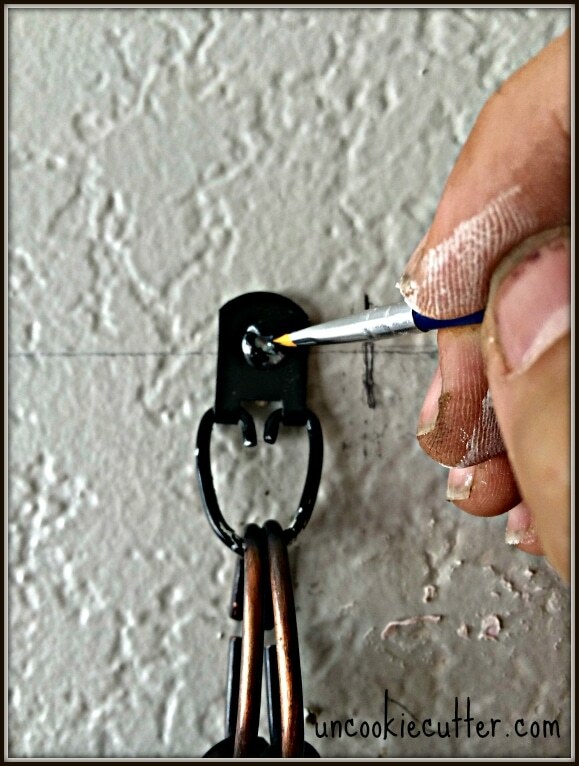 I love this kind and despise the kind where you drill and hole and hammer in a bracket that is supposed to open up and grip the wall. Those only work about half the time for me and I end up throwing them and becoming an angry mess with big holes in my wall. 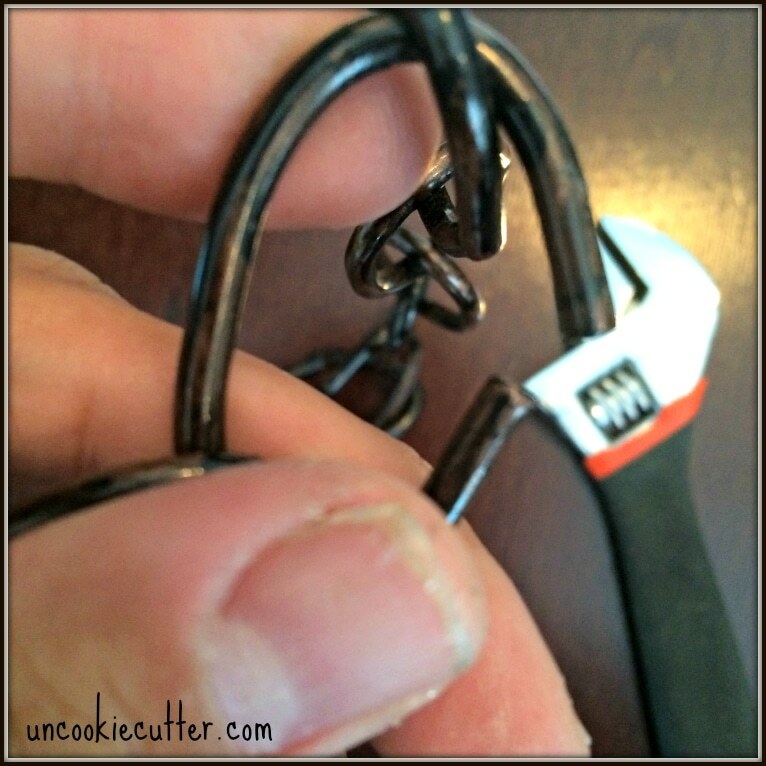 I realize it’s probably user error-but I have never once messed these up. They are pretty much fool proof. First I drill a small hole, just to start and make sure I’m not on a stud. If I hit a stud, great! No need for an anchor. But if there is no stud, I just screw these in with a simple screwdriver and then they are ready to go. So, one more note, I also had to do a bunch of touch ups. I painted the screws holding the hangers up black to match. And I had a few spots on the wall, so those had to be touched up as well. NOW I was done. Wait, I had to add a bunch of pretty things. It makes a pretty nice “sideboard” and a unique addition for very little money. I used leftover stain and poly (it didn’t take much at all) and so all I bought was chain and hangers- less that $10. 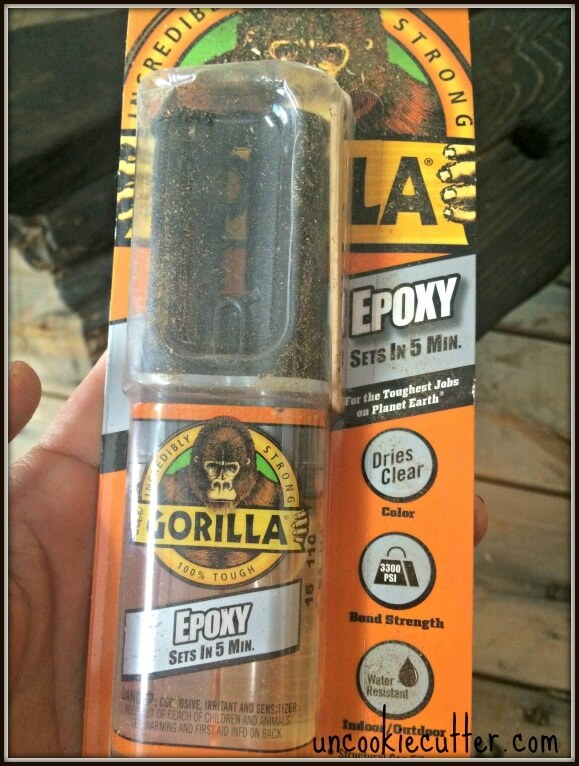 And if you need stain and poly, you could just get those little samplers and the whole project would cost you less than $20. 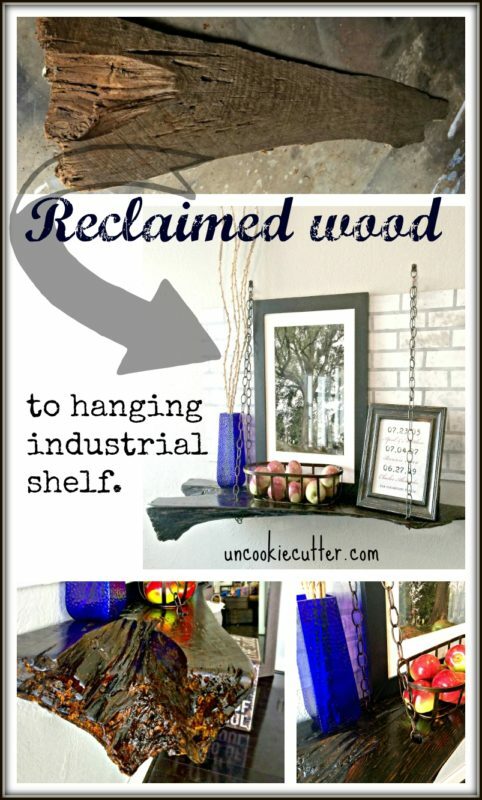 I love inexpensive projects and this Reclaimed Wood Hanging Shelf is the perfect example of one! Thanks for reading and I’d love for you follow me on social media! Thanks so much for having me, Amanda! Thanks again for having me, Amanda! April, I love this new shelf with you new dining room table! It looks fantastic and your table is beautiful! Great job! Hi, April ~ LOVE this shelf! Such a unique idea, and I love how it looks with your table! And the brick detail hanging behind is such a beautiful touch. Awesome job! Isn’t her table just awesome?? I need her to come make me one! This turned out amazing! April did a wonderful job, I am loving this idea. 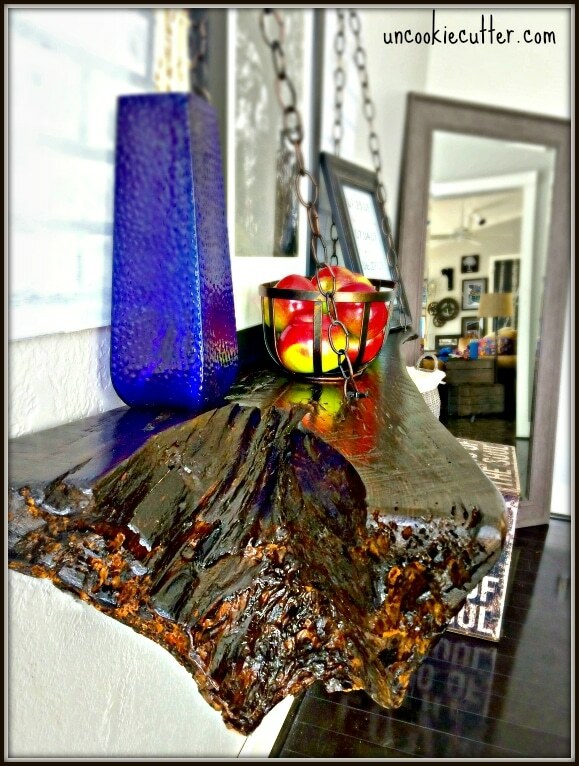 I love the “live wood” look… also — Oklahoma?! me too! Hi Heather, and thanks! I think I’m remember briefly chatting with you on your blog, you were featured somewhere but now I can’t recall. We are loving Oklahoma! This beautiful and so creative! That is a neat way to fill the cracks too. 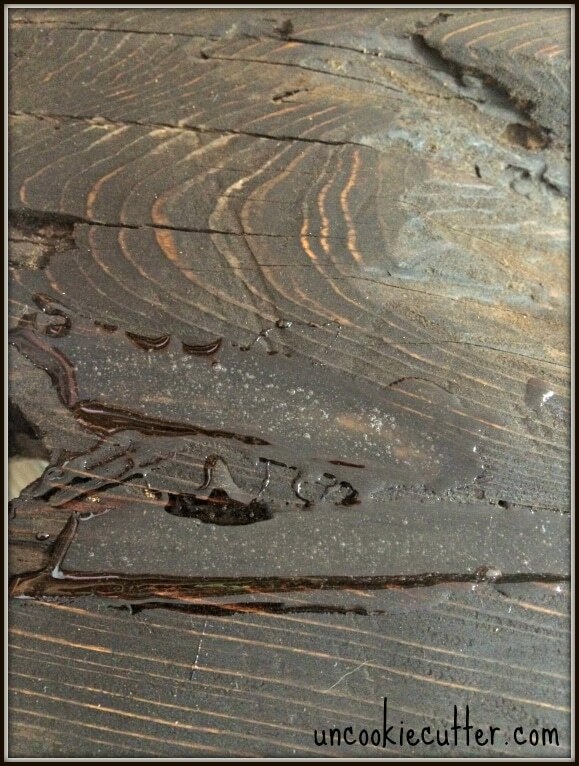 Btw, love your floors! I can’t wait until we redo the main floors in our house.